A month away from home…a daunting idea for some. Traveling overseas is always an expensive flight. So as long as you are spending the money to fly, you might as well stay awhile. In August 2014, my travel agent friend Jill told me about a new ship being built by the Viking Cruise Line. A new concept for the company, they were starting ocean cruises. The trip Viking Homelans cruise traveled between Stockholm, Sweden and Bergen, Norway. Stops included Finland, Russia, Estonia, Poland, Germany, Denmark and Norway. I was hooked. So sticking with the idea of traveling for a longer time, I booked a week on each end of the cruise. Stockholm was first. We rented an apartment from Veronica and Urban on Airbnb. Mike and I have stayed at several Airbnb homes and have really had good experiences. This was no different. We arrived the morning of May 23, early in the morning. We caught a bus at the airport and arrived at Central Station where we rode on the T-bana (subway.) After a short walk to our apartment, Urban met us and was kind enough to let us check in early. 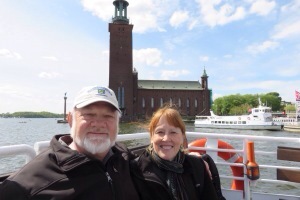 We went on a tour of Gamla Stan, the Old Town. Tour was ok. Lots of historical information that was good, but the tour guide was somewhat distracted by her cell phone. Went back to the apartment and across the street for dinner. Urban recommended Östgötakallaren as a traditional restaurant. It was, only German. Great food. 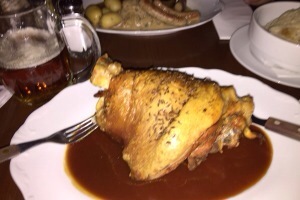 I had a pork shank as big as my head! The day began early, about 4AM, to be exact. Call me Grandma Fern. I was up and drinking coffee. It is bright as day that early, even earlier. The apartment did not have any room darkening shades. It would take some practice sleeping with this much light! We went to the island of Djurgården to the outdoor museum Skansen. This is clearly a family destination. Lots of children and parents. A kind of like Swedish Plimoth Plantation. Many examples of Swedish homes over time. 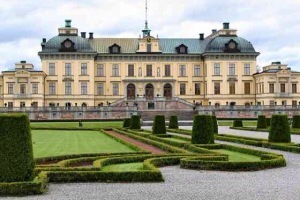 It was a beautiful, sunny day so we decided to take advantage of the weather and go to Drottningholm Palace, the home of the royal family. It was about 45 minutes by boat, a very enjoyable ride across Lake Malaren, the third largest lake in Sweden and the source of Stockholm’s drinking water. The people in the city are very proud of how clean the lake is. We had a tour of parts of the palace. The gardens were reminiscent of Versailles. On the boat ride home I fell asleep. I guess four hours sleep didn’t do it for me. But I got my second wind. We headed to the Pelikan for dinner. Mike had reindeer and wild game sausage. I had cod served with loads of fresh horseradish and finally tried Toast Skagen. 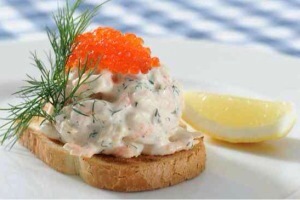 It is a mixture of prawns, mayonnaise and dill served with toast points. It is yummo!